Chicken karaage, those irresistible nuggets of boneless fried chicken served at Japanese izakayas, is one of my favorite beer bites when I find myself attempting to melt the day away with a Japanese brew. 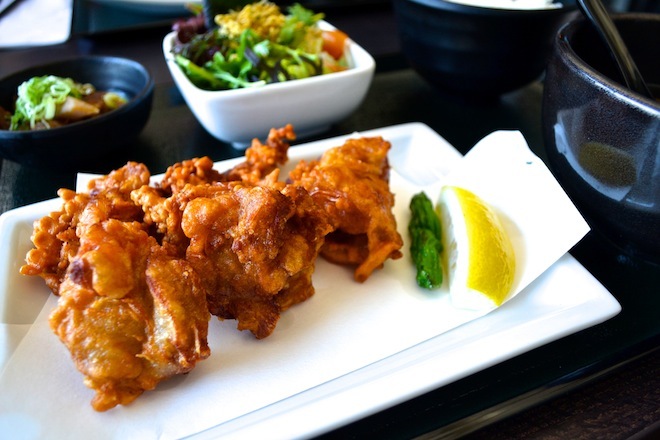 Your standard chicken karaage includes meat marinated in soy sauce, ginger, and garlic then dredged in a coating of wheat-based or potato starch batter. Each piece of succulent chicken usually takes one or two bites to devour. This is definitely not the case at Gyoro-Gyoro Izakaya in Encino. The generously portioned pieces are about the size of one of Honey Boo Boo’s fists. Each golden brown piece will require three to four bites to comfortably polish off. When the robust crust is breached by teeth, the reward is an exhilarating crunch. Steamy juiciness then leaks from the dark meat into your mouth. The garlicky and salty flavors from the meat and crust join in on this delightful sensory soiree. Fried shishito pepper and a wedge of lemon lend a bright heat to the otherwise ideal piece of chicken. Needless to say, a good beer to wash all that karaage action down makes this meal a summer sensation. If you think you’ve experienced chicken karaage, think again. The ones at Gyoro-Gyoro are the only ones Godzilla can go up against.